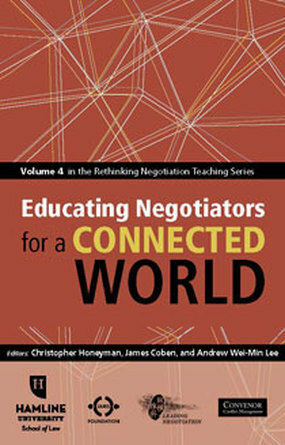 Educating Negotiators for a Connected World is the final volume of the Rethinking Negotiation Teaching project. It is edited by Christopher Honeyman, James Coben and Andrew Wei-Min Lee. Published 2013 by DRI Press, an imprint of the Dispute Resolution Institute at Michell Hamline School of Law, the book is available from Amazon.com; with the generous financial support of the JAMS Foundation, every chapter in the book is also available free in PDF format. Copyright: We encourage teachers to use any chapters in your teaching and training. There is no charge provided that copies are distributed at or below cost, you notify the publisher (sharon.press@mitchellhamline.edu) that you are using the material and describe the context, and you provide attribution as follows: Copyright 2013 DRI Press, Michell Hamline School of Law, Author and Chapter Title. Description from DRI Press: In 2011 more than 60 of the world's leading negotiation scholars gathered in Beijing for the Rethinking Negotiation Teaching project’s third and final international conference. The event, like the preceding conferences in Rome and Istanbul, was designed to inspire a diverse and energetic group of scholars to push forward their thinking on what is taught and how it is taught in contemporary negotiation courses. The resulting productivity required two volumes. This one wraps up the project as a whole. Multi-disciplinary and multi-national teams address the challenges of teaching negotiation in the face of profound cultural difference; move forward a project special focus on “wicked problems” (those ill-defined, ambiguous challenges for which even defining “the problem” is elusive, let alone attaining a “solution”); design innovative and concrete teaching tools for use both in and outside of the classroom; and introduce an array of new topics for the field, ranging from the possibilities of “informal” education to the role of physical movement in negotiation instruction. What does it mean to “rethink” a field? These three chapters offer both theoretical and highly practical takes on the subject. 1. Introduction: What Have We Learned? In this chapter, the authors make coherent a sweeping range of topics treated in the RNT project’s first two volumes. (A personal note: The editors continue to believe that the chapter authors have been too kind about what we see as the project’s numerous errors.) Nevertheless, this chapter is the right starting place for any teacher who, upon seeing four volumes that purport to help him or her redesign a course, knows that the course is bound to be too short to incorporate most of the material. So, where to begin? Well – here. The authors admit a strong preference for preservation of the baby. They present a cogent argument that contrary to the imagery sometimes used in the RNT project, there has been no sharp 1.0 to 2.0 divide, no sudden shift in our collective thinking about what our field contains or should teach. Rather, they point out, the teachings of the field have evolved steadily and gradually over several decades, with at least the better courses regularly incorporating aspects of the new research. The whole “Negotiation 2.0” concept, they argue, thus runs the risk of undermining that continuity, and implying instead that some of the core concepts that have proven to be widely applicable around the field and around the world are now to be distrusted. The authors also object cogently to a second potential consequence of this imagery: that the hard-won learning of many generations in older societies about how people should deal with each other is now to be distrusted, seen as out of fashion, and even replaced entirely by a set of imported concepts that may be largely unsuited to the culture importing them. In 2011, the authors set out to create from scratch the first fully-realized course to take advantage of everything that had been learned up till then in the course of the RNT project. For 2012, they have already revamped the course, to respond to their own initial critiques as well as to some of the latest writings, in this volume and the parallel volume 3. The result is the closest educational venture that yet exists to the project’s original intent to create a “Negotiation 2.0” course. Fortunately, the length of the course series the authors designed is significantly greater than a typical compressed “executive” course. That has allowed room for a significant degree of depth, subtlety and experimentation. Inspired by the Beijing conference’s focus on the necessity of adaptation, these five chapters offer diverse perspectives on how our field as a whole might best educate negotiators for a connected world. Developing further the “adventure learning” experiments conducted by the project in Istanbul and reported on inVenturing Beyond the Classroom, the authors tried new negotiation experiments in the markets of Beijing. Comparing their experiences from their respectively Chinese-Malaysian, Mexican, North American and Indian cultural perspectives, they conclude that self-awareness must be a central requirement in cross-cultural negotiation training, and that up to now, it has been far too commonly taken for granted. The authors note with appreciation the rising volume of research discussing cross-cultural negotiations; but they find its application to teaching and training often arid, simplistic and unpersuasive. They argue for a richer and more complex treatment of culture in negotiation, to give a more accurate impression of two salient circumstances in particular: the degree to which factors believed to be culturally distinct operate in “intra-cultural” negotiating contexts as well as in cross-cultural ones, and the degree to which negotiating dimensions, concepts, strategies and tactics may be similar across cultures, such that a belief that a completely different approach is required as soon as one is negotiating with someone from another culture is as likely to provoke error as a belief that one can safely behave exactly as one would at home. helping the students perceive the universality at the core of principled negotiation. 8. Muntu Meets Mencius: Can Ancient Principles Guide Modern Negotiations on the Export of Africa’s Natural Resources to China? Discussions of negotiating relationships across cultures tend to start with the assumption that one of the cultures will be American, or at least European. In this chapter, Bernard and then Mitchell start with a completely different environment: the rapidly expanding relationships, commercial and otherwise, between China and sub-Saharan Africa. They find much of the negotiating pattern, unfortunately, to be anything but sensitive to the real cultural and economic needs, particularly of Africa. Bernard’s text proposes, and Mitchell’s commentary assesses, a possible shift based on teaching negotiators in key settings some shared cultural elements, represented by similar proverbs in Chinese culture and a wide variety of African cultures. The authors also discuss some differences that may be an enduring source of trouble. The authors assess the prospects for teaching public policy negotiation and mediation across Asia. They find that the doctrines they were presented with as embedded elements of teaching materials presume a number of factors that are associated strongly with Western culture, but which are hard to find in public policy dispute management in Japan, Singapore, or Korea. Yet contrary to the perhaps-expected response that the training and teachings must now be thoroughly modified to respond to the context, the authors find themselves concluding, in part at least, that their societies would benefit if targeted ways can be found to use the Western insights to help open up public policy processes in their societies. From Chinese and American perspectives, the authors consider a Chinese negotiation class, when presented with an ethical problem or two, as a lens. They examine the implications of the students’ decisions for Chinese negotiations, particularly in an environment of law practice. In turn they use these as the basis for an analysis of the larger implications of a rapid and disorienting series of recent changes in Chinese law and legal practice. The six chapters in this section are as diverse as any in the RNT series, but they have one thing in common: they all address topics or techniques that are just beginning to be discussed, in classrooms anywhere. Ruminations on “the utility of beauty” and the “golden rule” are followed by analyses of how to get students to understand whatever they just did or saw, both inside and outside the classroom. The section ends with a chapter that proposes a radically new environment for teaching, and one that takes the concept that “everyone negotiates, everywhere” to its logical extreme: the ring, in professional boxing. Many people who are learning cross-cultural negotiation are studying the subject for utilitarian reasons, because they expect to negotiate commercial, industrial, or governmental issues across cultures. They may not immediately perceive the relevance of aesthetics. But to a significant extent, any of these kinds of negotiations is likely to have an environmental component, even when the presenting issues in the negotiation do not appear to be primarily “environmental” in content. Thus it becomes germane to a surprisingly large range of people that perceptions of what is appropriate environmentally have a consumption-versus-conservation element that is, at some fundamental level, about differing cultural perceptions of what is useful – and what is beautiful. The authors analyze some of the implications, including the perception that better cross-cultural training and wider travel is helping many people to appreciate others’ views of beauty. That leads to a degree of aesthetic and social “convergence” that will be needed in future, for very practical purposes. This chapter picks up where The Psychology of Giving and Its Effect on Negotiation (Chamoun and Hazlett 2009), Finding Common Ground in the Soil of Culture (Bernard 2009), and Re-Orienting the Trainer to Navigate – Not Negotiate – Islamic Cultural Values (Bernard 2010) left off earlier in the RNT series. The authors argue that principles of generosity are strongly supported by principles common to all the world’s major religions, and that it follows that precepts that are widely shared (in theory) might yet be taught to be actually followed in negotiation practice. This, they contend, would have major effects not only on the general level of cooperation vs. competition, but on the specific, material as well as spiritual, well-being of the negotiators as individuals. There is a paradox, though: the spiritual benefit inures to you only if you don’t strategize to achieve it. An afterthought; a rushed invitation for general comments; some PowerPoint slides flashed at the end of an exercise; a pre-prepared reading list of “take away lessons” . . . . do these sound familiar? The authors argue that all too often, good intentions for thorough debriefing of negotiation exercises degenerate into something disappointing, or even pointless. They contend that debriefing is too critical an element in overall learning to be defensibly treated this way. In a thorough analysis that should also be read in conjunction with the same authors’ treatment of debriefing adventure learning specifically (chapter 14 in this volume), they first outline a choice of goals; then analyze the characteristics of good debriefing work, and discuss some general approaches; and then outline predictable challenges and some tactics for handling them. As is appropriate for the project’s increasing focus on the differences between student groups (see Lewicki and Schneider, Instructors Heed the Who, chapter 3 in Venturing Beyond the Classroom), the authors end by discussing how debriefing might be tailored for specific audiences. This chapter (which should be read in conjunction with the same authors’ Debriefing the Debrief, chapter 13 in this volume) addresses the special conditions which attach to efforts to debrief adventure learning. The same real-world authenticity that is the most attractive feature of adventure learning, they point out, introduces predictable problems – beginning but not ending with the mundane failure of negotiating groups to return to class at the same time, when the debrief has been scheduled. But it gets worse than that, in ways the authors cheerfully outline. The authors follow with a number of suggestions, which collectively should help students get the most out of the exercise – and help the teacher sleep better the night before the exercise. Many writings in this series have argued for greater authenticity in training and teaching, including getting students out of the classroom. No greater authenticity in negotiation teaching settings is likely to be found than in the authors’ experiments with teaching students who are actually at work negotiating, while they really are at work. The authors argue that two key attributes of authenticity are served by this technique: repeated engagement, as distinct from isolated role-plays, and expanded stakes, where the student stands to gain or lose in an immediate career sense. Not only is the training, at least in part, actually performed at work, but the students are observed closely by people who are associated with management. The authors report on early experiments in a multinational business setting (in Mexico and the United States), and a public policy setting in Singapore. In this groundbreaking piece, a group of authors with unimpeachable expertise in one of the least likely environments ever considered for negotiation analyze what is actually going on in the professional boxing ring. Their surprising conclusions take the facile claim of our field that “everybody negotiates” to a whole new level. Not only does this chapter serve as a kind of extreme-case demonstration of why students should consider learning negotiation to be central to any occupation they may take up in future; it might well serve as inspiration for some new studies in other fields in which negotiation may previously have been thought irrelevant. Building on chapters 24-27 in Venturing Beyond the Classroom , the chapters that follow explore how educators can take on the challenge to address “wicked” problems in negotiation courses. 17. Adapting to the Adaptive:How Can We Teach Negotiation for Wicked Problems? This chapter picks up where the “wicked problems team” left off in Venturing Beyond the Classroom: with the need to formulate effective teaching strategies for an exceptionally important area of inquiry, in which our understanding is, as yet, far short of perfection. Docherty and Lira are examples of professionals whose students cannot wait for anything close to perfection: both in peacebuilding and in the military, a professional must work with the understanding that is available. It is significant that in their very different environments, Docherty and Lira have been learning from each other, adapting ideas from the military into peacebuilding and vice versa, in order to formulate teaching programs that can work even within the single perspective of either discipline. Their experiments are groundbreaking, and of importance to many other professional fields. Following directly from the preceding chapter, Lira and Parish lay out a potential example of a training course for “wicked problems,” finding unexpected parallels in two completely different professional environments: the theater and the military. The authors demonstrate how an elective “Design” course in the U.S. Army Command and General Staff College parallels the development of theater professionals. This matches the insights of Jayne Docherty, a professor of peacebuilding, in the previous chapter and the one which follows. In a conscious parallel to the preceding chapter, Docherty describes an initial experiment, developed largely from Chrustie’s practical experience, with teaching “wicked problems” to graduate students in peacemaking at a Mennonite university. The collaboration between a professor of peacebuilding on the one hand, and a highly experienced police officer and peacekeeper on the other, is as significant to the development of our field as the flow of information, experiments and ideas back and forth between the peacebuilding professional environment and the Command and General Staff College of the U.S. Army, discussed in chapter 17 in this volume, and further amplified in this chapter. In the initial joint effort of the RNT’s “wicked problems” team (Chrustie et al., Five Stories, chapter 25 in Venturing Beyond the Classroom), the authors began with the more dramatic, international and violent settings, and worked from there to demonstrate how these problems also operate within less violent environments, such as city politics and the internal doings of a large organization. Here, in an effort to assess for teaching purposes a major new work in the field (The Five Percent, by Peter Coleman 2011), the authors begin in the opposite order, and scale up their discussion from the most modest of beginnings – a vegetable – to conclude with analysis of one of the most contentious and unstable disputing environments: peacekeeping. Many readers of this book, and this series, may start out thinking that of all the problems and all the issues and all the techniques they need to engage with as teachers of negotiation, at least they can leave “wicked problems” to specialists in international, environmental, race relations and other “intractable” conflict. Howard Gadlin’s analysis in chapter 20 of the role of wicked problems inside any large organization should be enough to give pause to that complacency. This chapter’s three authors normally encounter students who are more “typical,” recent-graduate-level, and classroom-oriented than the midcareer military professionals discussed by Leonard Lira and Rachel Parish in chapter 18, or the often middle-aged, returning students in the graduate program in peacemaking described by Jayne Docherty and Calvin Chrustie in chapter 19. The authors candidly assess barriers and offer up a series of practical recommendations for teaching “wicked problems” in planning and public policy, business, and law programs. Predicting the future is a notoriously chancy business. That said, these concluding chapters in the RNT series challenge all of us to think in new directions. We are prepared to predict that at least some of the new directions will be far-reaching. Moving on from the same authors’ seminal 2009 critique of the overuse of role-plays in negotiation teaching,Death of the Role-Play (chapter 13 in Rethinking Negotiation Teaching), Alexander and LeBaron have taken the rapidly increasing enthusiasm for experiential learning in a new direction: multiple intelligences. Their particular interest is in a use of experiential learning that focuses on kinesthetic intelligence, employing actual physical movement, particularly dance, to unlock creativity in other mental domains, as well as to encourage authentic participation by people whose skills are not primarily verbal or mathematical. Those who may be inclined to be skeptical should note that this work is receiving increased attention among people whose dominant skills are definitely verbal: this chapter serves as a brief intro duction to a project whose longer work is to be published soon by the American Bar Association. Perhaps the “other side of the coin” of the preceding chapter, this chapter’s authors review what has been learned about long-term relationships from the insights of game theory. They note that game theory’s presumption of “rational,” interest-maximizing negotiators is a significant limitation, in a world in which is increasingly accepted that we all think from the starting point of our emotions (see Patera and Gamm, Emotions – A Blind Spot in Negotiation Training, chapter 19 in Venturing Beyond the Classroom). Evolutionary game theory, they argue, provides a basis to learn from repeated interactions, which could be adapted by introducing emotional bias into the game theory framework. This would allow game theory to be used in analysis of altruism, empathy, reputation and other phenomena which are becoming more and more important in teaching negotiation. Their analysis also challenges us all to absorb more via a kind of intelligence most negotiators rather desperately avoid exercising: the mathematical. This chapter envisions a negotiation game which can promote learning, as well as fact-finding on any hot-button issue. The authors outline a particular form of online game, in variants separately designed to work with formal education, working professionals, and the general public. The game, as conceived here, is designed to address a mounting problem in negotiations of the largest scale, public issues: an apparently increasing tendency of people and parties to make up their own facts. Global climate change is considered as a test case. A related chapter in this volume, The Education of Non-Students, assesses the prospects for a related new strategy, using theater, film and games to begin to provide informal negotiation education for the vast majority of the public who will never take any kind of course on negotiation. Yes, the authors concede, “everybody” negotiates: but that’s like saying “everybody drives,” and then watching aghast when “everybody” climbs into a racing car, or an eighteen-wheeled tractor-trailer. The authors draw from Tsur’s experience teaching Israeli hostage negotiators and in other high-pressure environments to argue for an entirely distinct concept of a professional negotiator, one that starts with a rather experienced “student” and builds a sharply different training regimen from there. Most people do not take courses – yet they learn new things and change their attitudes and behavior all the time. So far, with some exceptions, our field has taken little advantage of informal avenues for education. This concluding chapter explores how we might foster social change toward better attitudes in negotiation, using various media far outside the classroom setting (electronic games, film and other visual materials, and theater) that can serve as platforms for informal negotiation education. The authors believe our field needs not one or two, but an array of such approaches. Collectively, the scholarship produced in the RNT project significantly “ups the ante” for what teachers ought to provide (and students and institutions ought to demand) in quality negotiation education. But can these higher aspirations be reconciled with the rapidly changing economics of higher education and the “entertrainment” tendencies of the executive training field?